The fevers have parted. Noses have, essentially, stopped running. The sun shone brightly and warmed that crusty, frozen surface of the home we call Earth. We stepped from our den of hibernation, a place we've been squirreled away for the better part of two weeks, riding out a miserable flu, into the outside world. What a miraculous feeling to absorb that heat. That light. To breathe the cold winter air into recuperating lungs neglected with days of dry, indoor air. The boys quickly realized the sun had softened the top layer of snow just enough to make it sticky. 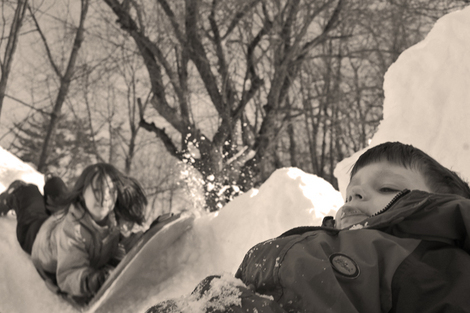 We rolled it in white mounds all about the yard to make a wall which soon formed into a fort. Calvin grabbed his sled and began making quick steep runs off our mammoth snow pile. Using the fort wall as a banked turn, he slid with a fury, narrowly missing Ezra's feet on each descent. Ez did not peep nor move. He sat, silently. Content to be out of doors munching a block of snow. Adelaide, the latest and hardest hit influenza victim, was happy to be in Mama's arms watching the action. And Mama, delighted to be taking a well deserved writing break and soaking up some sun of her own. Legs turned, blood pumped, eyes closed and thought of nothing but that very instant and the feeling of being. Healthy. It's snowing again as i write this. All are asleep (except Mama, of course) and I turn off each of the lights and walk out into the yard. 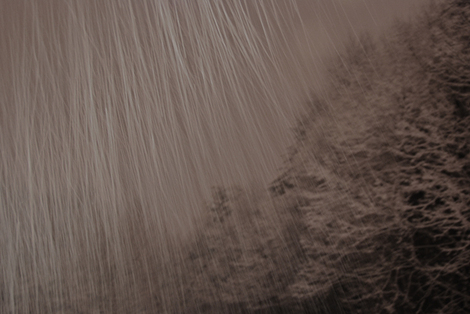 The flakes, big and wet, drop and silently wipe away the traces of life that were here only moments before. Like an evening tide erasing a thousand footprints that won't ever be duplicated. It is magical and it is bittersweet and it is all that I believe.